What Do You Want? Clean, radiant, healthy hair! How Do You Want it? With products that were created to handle the many facets of my hair texture! If your challenge is fungus and an itchy scalp, then the blend of Peppermint and Tea Tree is your answer. As an anti-bacterial, anti-fungal and astringent, Peppermint and Tea Tree essential oils helps remove build up and fungus from your scalp and hair. 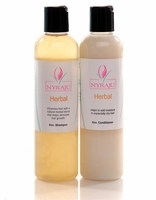 On the other hand if dry brittle hair is your challenge, then the Herbal blends of Lavender and German Chamomile essential oils and Aloe Vera is the product for you. Created with your hair in mind, these products will have your hair feeling strong and looking healthy. Make your choice today and purchase Peppermint Tea Tree or Herbal Shampoo and Conditioners for your hair care needs.